The northern and eastern boundaries of Toronto’s Grange Park tuck up close to two venerable institutions, the Art Gallery of Ontario (AGO) and the Ontario College of Art and Design (OCAD). Over the years, the park has been featured on many a canvas and in innumerable sketches and watercolours. 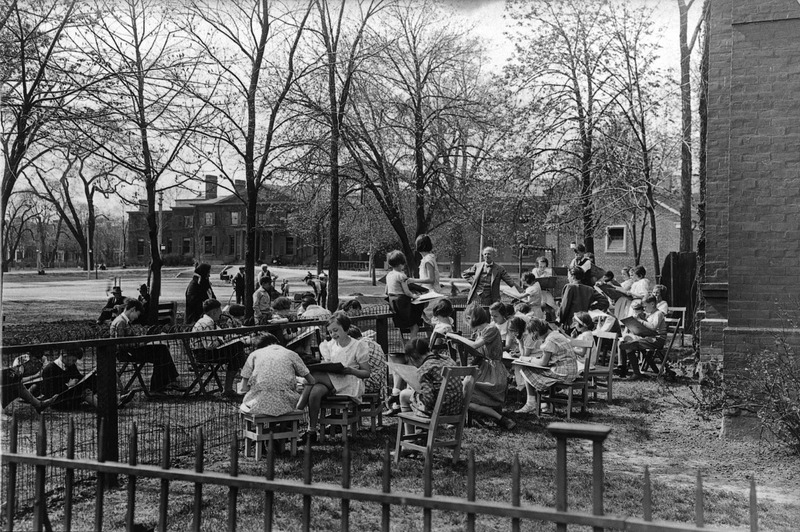 Canadian Group of Seven member Arthur Lismer led art classes for kids in this green space not far from the city centre. 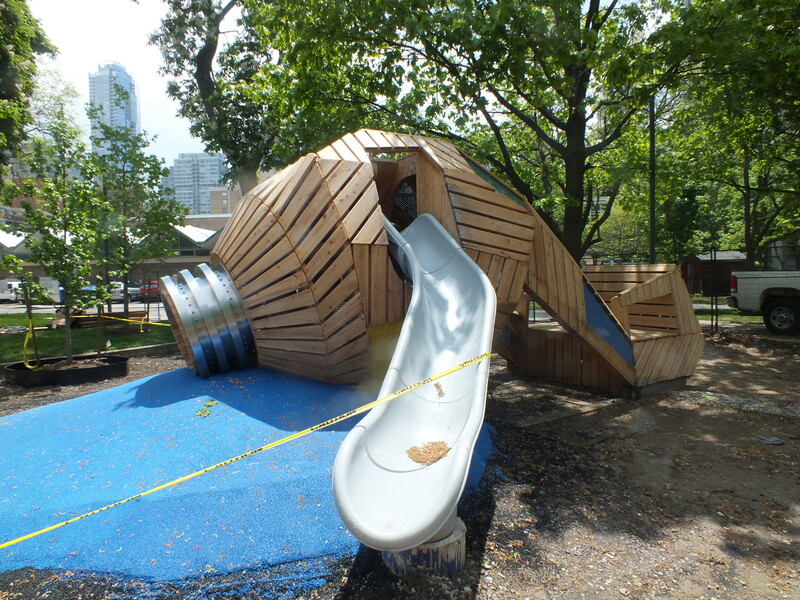 Today, kids are reclaiming the park with the opening of a new Earthscape and PFS Studio design and build playscape. The last time I was in Toronto, I had a chance to get a tour and poke around as the space was nearing completion. I was intrigued to see the treatment as the visual arts run in my family. Let’s cut to the quick, they took a huge leap over me but one of my older daughters was recognized by enRoute magazine as one of the top ten instagrammers to watch in the country. If you’re curious about her photos, check out seriouslyalexa. My younger kids are prolific artists in their own right. The wall surfaces of my home and work offices are festooned with their creations. Their collected oeuvres are a constant bright spot in my days. 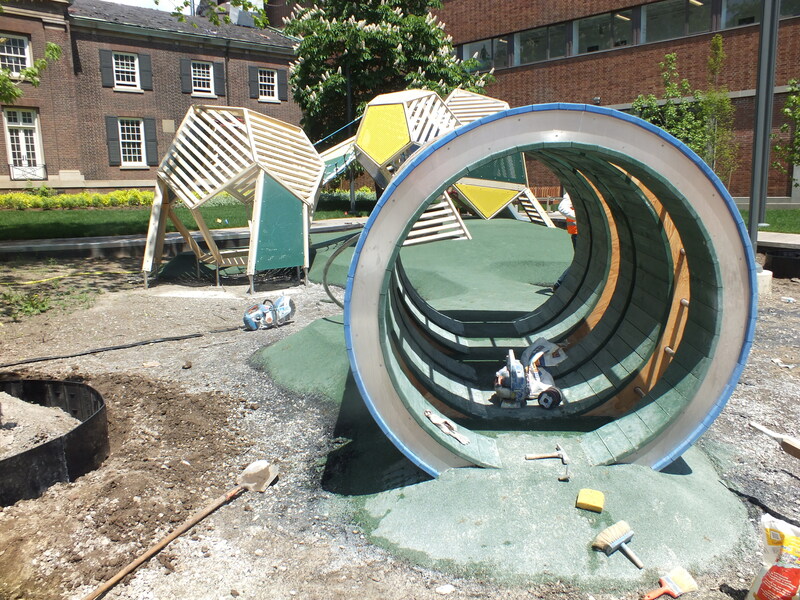 At the south entrance to the playscape, the journey begins with two platforms approximately 8 to 10 feet above ground level supported by stylized blue, green and yellow conté sticks. The larger platform is nestled up against a mature maple and represents an artist’s palette. The day of my visit, the wooden planks are carpeted in green, awash in two winged helicopters. 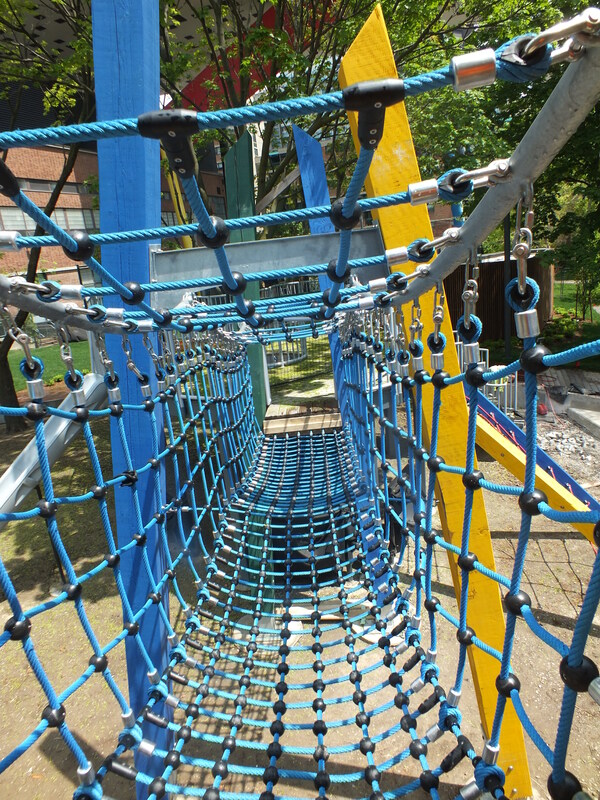 It’s the wobbly practice-your-balance nylon braid tunnel connecting the two platforms that is sure to get a lot of traffic. The intimation of adventurous derrin-do suspended above the ground will be an irresistible attraction pulling kids to scamper up and down the gentle incline. I couldn’t leave before trying it myself. I wobbled, bobbled and painlessly hobbled my way across thinking of the squeals of delight that will erupt from my three youngest and my TO grandkids when they get a chance to give it a test drive. Adjacent to the slide tower is a huge, climb-inside-me tube with oozing bouncy blue paint pooling under the nozzle and streaming to the conté tower. There’s a slide here for the small kids who will get a kick out of entering the tube, swooping down to the ground below and then wanting to try it again and again and again. 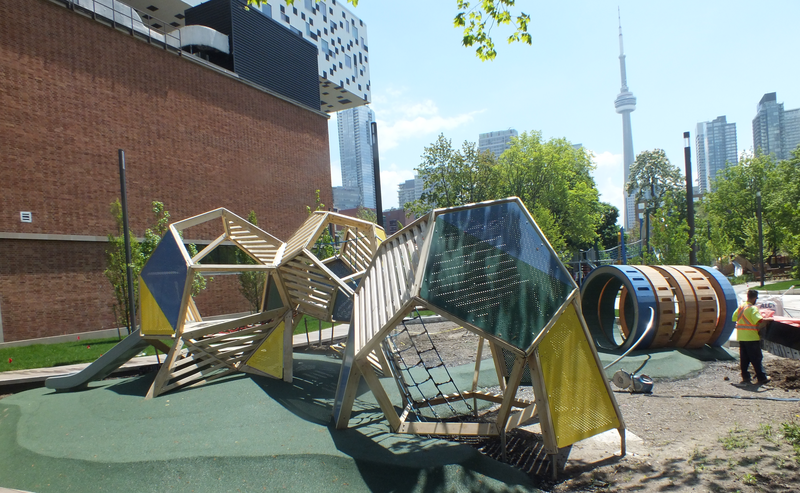 On the north side of the playscape is the the most challenging design and engineering element of the project – a series of connected dodecahdrons. Sitting there they look deceivingly simple but these shapes designed to simulate crushed paper models common to art classes were not a walk in the park to build. Now that they have come off the CAD/CAM drawing board and into real life, they offer more cubbies for climbing, hiding, balancing and sliding as well as interesting shapes, sight lines and angles. The final piece in this artistic tour de force is the lowly paint can, a vessel of colour just waiting to be applied, or spilled as the case may be. And hasn’t this crafty, painty spillage happened at all of our kitchen tables? It’s part and parcel of the creative process. If you can’t get messy, where’s the fun? As the kids wrap up their play at Grange Park they may not be thinking of their next masterpiece but clearly they will have exercised body and mind in the art of play. Here’s an early rendition of the playscape. There have been some modifications and adjustments since this animation was produced. See if you can find them if you have a chance to visit. 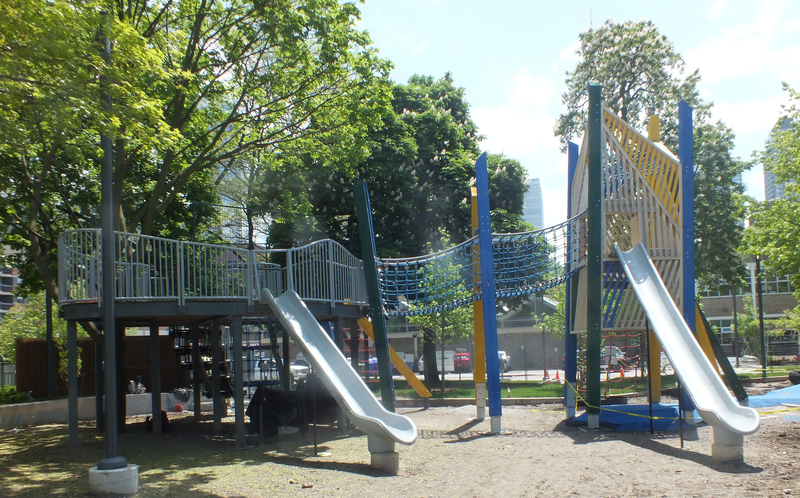 Ed’s note – In late May I had the pleasure of getting a tour of the nearly finished playscape in Toronto’s Grange Park. Earthscape Senior Landscape Architect and Project Manger, Dennis Taves, took me around the site which was still getting a number of touch ups from a friendly work crew. We grabbed a quick bite to eat underneath the ‘palette’ during a cloudburst. Shout out to my son-in-law James who had packed me some delicious buns with coldcuts and cheese from the family’s Tre Mari Bakery on St. Clair West. They were supposed to be for my trek from Toronto to Ottawa but Dennis and I got through half of them. You develop a healthy appetite touring and talking about play…. Thanks Dennis for your time.